The Stanford System connects and compares the teams, and develops a "Rating," based on the results of this season's games. For each game, the system considers who won, the margin of victory, and the location of the game. The "Schedule" column indicates the ranking of each team's schedule difficulty for games played to date. 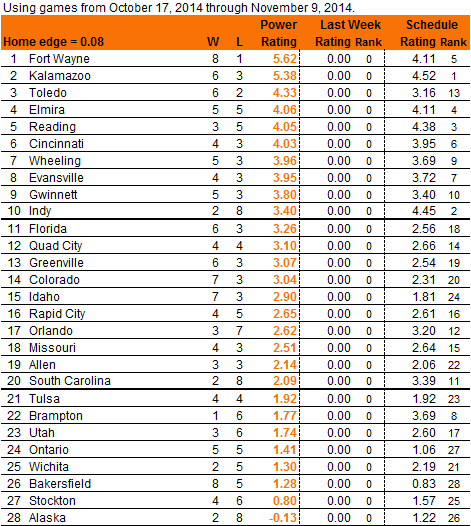 To predict the most probable outcome of an upcoming game, first add the indicated "Home Edge" to the home team's rating, then compare the two teams' ratings. The team with the higher rating is the most probable winner, and the difference between the teams' ratings is the most probable victory margin. This may seem a little strange until you consider the North Division teams are 11-2 against the Central and East Divisions. Wow. The entire North Division is in the Top 10.